Tibetan Plateau is a land of unparalleled superlatives: it is the largest and highest plateau on our planet, averaging 15,000 feet (4500m) in altitude. It is buttressed along its southern flank by the world’s greatest mountain range, the Himalayas. For many people, Tibet conjures images of barren windswept plains, and while this is true for regions of Northern Tibet, other regions are rich with diversity. The plateau is dotted with thousands of lakes and extensive grasslands are utilized by nomadic herders to graze yaks. Large tracts of forest in Eastern Tibet are regarded by China as their second most important source of timber. The glaciers and snowmelt of the Tibetan highlands initiate four of Asia’s greatest rivers, including the Indus, the Brahmaputra, Karnali & Sutlej including several major sources of the Ganges, the Salween, the Mekong, the Yangtse, and the Yellow Rivers. This tour guarantees to be a high point (in more ways than one) in any mountain biker’s life. This rugged, remote and beautiful country lies hidden behind Mt. Everest and many more of the world’s highest peaks in the Great Himal range. Only a few brave cyclists have dared to ride along its inhospitable plateau and forge a passage through these mystic lands into Kathmandu via Everest Base camp. The reward being the longest downhill in the world as you enter into Nepal, dropping an unimaginable 4500-m over 156kms. At a breathless average altitude of around 4450-m (14,596ft) this expedition is not for the faint of heart but made for the pioneer in the spirit that is fit and feels at home on a bike. With 15days of biking over 1104kms, you’d want to be!! Day 01: Arrival in Kathmandu o/n in hotel. Pick up from the international airport, transfer to hotel and welcome dinner. Day 02: Sightseeing in the Kathmandu Valley. Day 03: Fly from Kathmandu to Lhasa. The flight takes about one hour: if the weather is fine then the view of some of the world's highest mountains is magnificent. From the airport we have a one hour drive to Lhasa and our hotel. In the afternoon we familiarize ourselves with our bikes. Day 04: Breakfast at 7.30, then at 9.30 we visit the Potala Palace. We then have free time. Overnight in the hotel. Day 05: Breakfast at 7.30 then at 9.00 we visit the Jokhang Temple continuing to the Sera Monastery by bike. 22.8km, 105m of height gain.Overnight at hotel. Day 06: Breakfast at 8.00 then we leave at around 9.30 to reach Ganden (27km). From there we return to Lhasa along another route.Total 60 km, 365hm.Overnight at hotel. Day 07: Today our trip really starts. We use a jeep to travel the first 9km then bike over the Khamba La Pass, at 4769m. Overnight in tents close to Yamdruk Tso Lake. Day 08: (73.3km.) height gain to 4465m, 41/2 hours riding time). Today we bike to Nagarche (30 km) a small town where we can eat and drink. The road is at first, but then the dirt road starts. We cross the Karo La Pass (5100m, after 59km) then descend steeply for 14km to reach our campsite in a fine road-side meadow. Day09: (60km.) today starts downhill and then along a flat section beside a river, passing beautiful Tibetan villages to reach an artificial lake constructed to provide hydro-electric power. Now we climb to the Sim La Pass (at 4330m., 27.7 km.) We descend from the pass with care as a fall here would be into very sharp rocks. After a short climb to another pass we descend around hairpin bends to a small village and a lunch stop at 43 km. From there it is a mainly flat road to Gyantse. Day 10: (93km. /4 hours).The road from Gyantse to ShigatseTibet's second city is paved and flat, so this is an easy day. We ride through agricultural scenery, with many Tibetans working the fields at the roadside. We stop for lunch just beyond a small town, at 48km, where there is pleasant meadow besides the road, a fine place for relaxing after the morning ride. In the afternoon we continue to Shigatse where we overnight in a hotel. Day 11: Sightseeing visit to the Tashilagpo Monastery in the morning, then the afternoon free. Day 12: (105km.). We follow the paved road slightly uphill out of the city, but then across mostly flat country until we cross a small pass (4010m at 31km) from where a new landscape can be seen: from here the terrain is desert-like rather than arable. After lunch we continue across more flat country to reach our camp site at the foot of the Tso-La pass. Day 13: (59km.) The Tso-La Pass, at 4505m, is reached after a long (10km) climb. Beyond there is an amazing 8km downhill run before a flat section reaches Lhazi. We may stop for lunch before reaching the town or push on to reach it. Lhazi has shops and excellent places to eat. From the town it is only a short distance to where we camp at a beautiful spot beside a river. We can swim here, though the water is very coldas the river flows down from the high peaks. Day 14: (72km./6 hours) It's a hard day today, with a nasty climb of at least 3 hours, rising over 1000m to the Gya Tso-La Pass (at 5220m. after 22km. ), one of the highest passes on the route. Because of the height it is usually very cold at the pass so we do not linger, going fast downhill to a small tea house where we have lunch. In the afternoon we follow the road to Shegar. Often this section of road is very dusty, but the views are good and there is a good hotel for the night with hot showers to take away the dust and the weariness of a long hard day. Day 15: (74.5km./5 hours). Today starts with a downhill, then flat ride along a paved road to a police checkpoint where we need to show all our documents. Here the main road continues to Tingri but we turn off for the Everest North Base Camp, climbing to the Pang La Pass (at 5200m at 34km) from where, in clear weather, the view of Everest, Makalu and Cho Oyo is stunning. We can stop for lunch here. Then we now go downhill to Tasi xo. This downhill ride is long and has many hairpin bends, but there are teas houses at the village where we can relax. Our camp site for the night is about 11km from the village along a flat road. Day 16: (31.7km./3 hours) we reach the Rongbuck Base Camp, starting off beside the Rong chu river with views of Everest ahead. The going is bumpy and with the altitude can be hard work, particularly on the last, uphill section, so we take it very slowly. We take lunch at Rongbuck, then continue to Everest Base Camp, another 7km. We have to cover those last kilometers on horseback as the rules changed in 2004 and no vehicles or bikes are allowed to Base Camp. Day 17: (70.5km./5 hours) we ride towards Tingri, crossing the Lamna La Pass. This is a delightful ride as the road is not in good enough condition for motor traffic so bikers have it to themselves and can enjoy the scenery. There are remote villages and meadows with yaks and sheep. We stop for lunch at after about 30km, having climbed 553m to reach an altitude of 5030m. From the pass we go downhill to reach a river across which there is no bridge - time to take off our shoes and wade through the cold, knee-deep water. 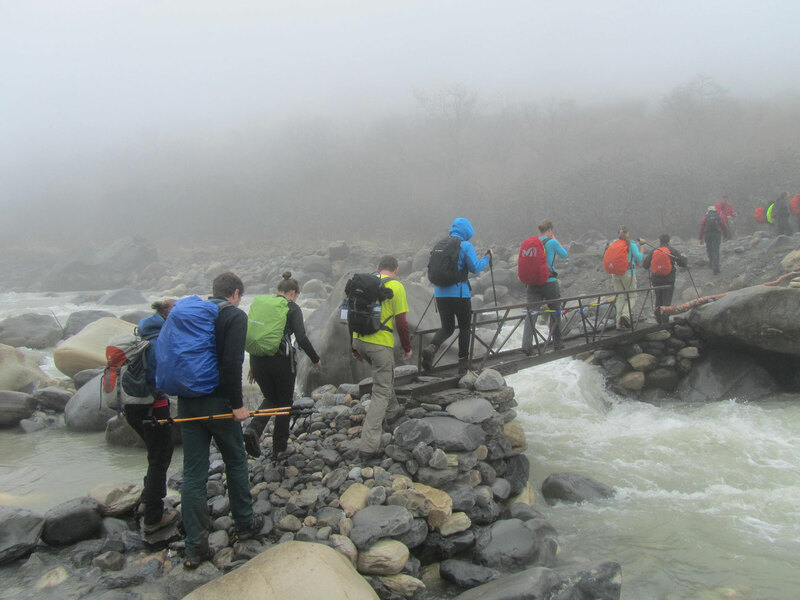 We now follow the river gently downhill to Tingri, a beautiful town with fine views of Everest and Cho Oyo. We overnight in a guesthouse. Day 18: (70.5km./5 hours). An easy day on paved, then dirt roads, but with no high passes. The views along the way, of villages with Tibetans in typical dress and beautiful landscapes, are excellent. We stop for lunch stop at 42.5km (185hm, 21/2 hours) close to a river. Then we descend to our campsite, close to a river where we can swim. Day 19: (82km./7 hours). Today we cross the Lalung La and Yakri Shong La passes. From our camp we climb straight up to the Lalung La (14.4 km, 447hm, 4910 m, about 11/2 hours), then after a short descent we climb again to the Yakri Shong La (26.4 km, 705hm, 5050 m 3 hours). To compensate for the climbs there are tremendous views of Shishapangma (Xixabangma), to the right, and other great Himalayan peaks. The Yakri Shong La is the last pass of the route. Beyond it there is a long descent to Nepal, probably the longest downhill road in the world. We stop for lunch after 36km, at 4534 m, where there is a tea house at the bottom of a steep downhill section. This is a good tea house with a strong mud wall which protects us if there is a wind blowing, as there often is. After lunch we continue down (though not now as steeply as before). It sounds easy, but the wind and dust can make this section hard work and we will be tired when we reach Nyalam, a town with opportunities for a drink and a rest. Our camp will be 3km from the town on a fine meadow site. Day 20: (55km./3 hours). Downhill again, this time concentrating hard as the road is rocky in places and a fall would be dangerous. Finally we reach the Chinese customs at Xhangmu (at 31km). The town is the last in China and there are often a lot of jeeps and trucks which add to the hazard of the descent. It can take some time to get through customs and is much easier if we stay together as a single group. Then it is downhill again for another 9km to Friendship Bridge and the Nepalese customs at Kadari. Here we stop for lunch at a restaurant which serves both Nepalese and western food. After lunch we continue along the valley of the Bhote Kosi River, crossing a suspension bridge from where people make the second longest bungy jump in the world. Day 21: (67.7km. /4 hours) You will probably feel a difference in temperature today - after the cold of the Tibetan plateau it can be 30°C as we ride beside the Bhotkosi River, with rice paddies on the slope either side of the valley. The road is 90% paved and mostly downhill for 37km, before turning uphill for 4 km. We then descend to Dolal Ghat Bridge where we can have lunch in the only local restaurant. Across the bridge the road is flat at first and then rises to Lamidanda. Beyond we reach a Nepalese Army Control Post before a final uphill section to Dhulikhel Resort where we spend the night. Day 22: (39.5 km. / 3hours) Today there is a choice - bus transfer to Kathmandu or bike all the way to Thamel if those who want to make the whole tour by bike. In Kathmandu we chose a route which takes us away from most of the city traffic. Day 23: Free day in Kathmandu, perhaps shopping for souvenirs for yourself, family and friends. Day 24: Transfer to the international Airport for flights home. It was 3month ago that we made the mountain bike tour from Lhasa to Kathmandu (Gertraud, Britte, Marlin, Harald, Reinhard). It was an unforgettable adventure, thanks for the good organization.